Organizations seeking to cut costs and increase productivity commonly turn to Field Service Management solutions to help them achieve their goals. 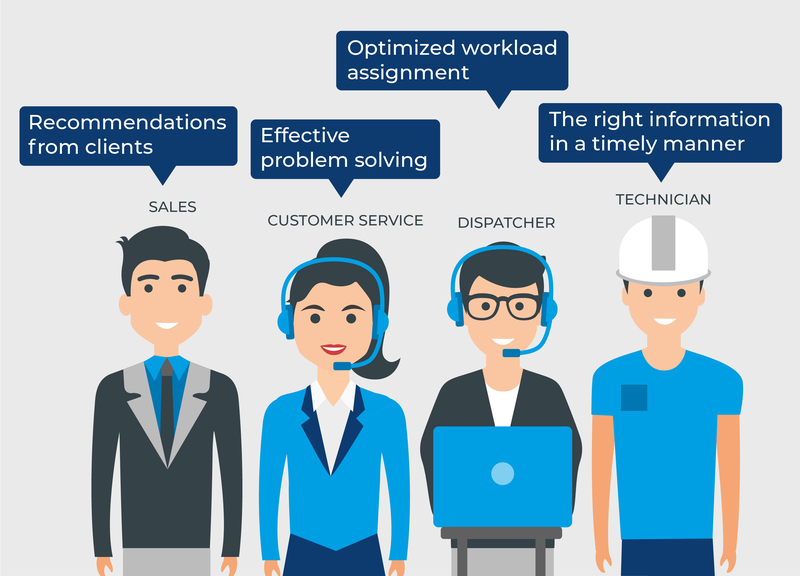 The benefits of FSM solutions include the optimization of labor costs regarding the number of technicians needed to carry out tasks, more effective call center management of task assignment and monitoring, and reduced corporate reliance on the unique skills of individuals and service suppliers – the latter through the implementation of knowledge base modules. The implemented solution allows an organization to reach the mentioned targets, and bring the benefits to various roles within a service organization. This article considers how investment in the Field Service Management impacts a business from different perspectives. Regardless of how many technicians, orders and vehicles you are responsible for, a GIS-based FSM tool lets you keep tabs on them via a combination of digital maps and mobile handsets with GPS or vehicle tracking equipment. The result is that you can find a technician with the right skills quickly, and dispatch them to a client location in order to resolve any given problem. For many clients, you are the public face of the company; and your organization’s reputation could depend on how you perform every aspect of any given task. At the same time, your employer needs you to optimize your time – doing more in any given period. Again, an FSM solution can help you balance these demands, bringing benefits to you, to the customer, and to your employer. Mobile field service management tools - deployed via a mobile handset – gives you all of the information you need about any assigned task. Your schedule for the day is accessible on the device, as are your route plan, documentation, instructions and remote network measurement tools. When you’ve done the job, the customer can sign off digitally, and the information is transmitted directly to the back office. Optimization shouldn’t mean only driving down costs to the lowest possible level. It’s about striking the right balance between expenses, resources and benefits. FSM optimization tools help you to do just this, for example by organizing your employees’ work optimally or by utilizing GIS system information to plan your routes effectively. When a field service technician arrives at a client’s premises with precisely the right equipment and parts to do the job required, it can create only a positive impression. On the other hand, customer satisfaction can take a severe blow if the technician needs to return to the warehouse in order to collect the parts needed to carry out an urgent repair. That’s not to mention the costs that this incurs the service company. The benefits of field service management include the ability to deploy optimization tools to help predict the nature and solution of problems, so that the majority of cases are resolved in the first manner rather than the second. Quick and easy access to accumulated, shared knowledge is another of the benefits of an effective field service management solution. So a knowledge base module can ensure your technicians are always prepared – even if a problem, customer, location or piece of equipment is out of the ordinary – by providing them with written and graphical instructions and information. Solving the problem, and solving it quickly at the first attempt, is one of your key goals. With FSM, you will be able to keep the client informed about which technician they can expect, and when, in real time. There is no need to break connections with a promise to call back later and make an appointment, which can certainly prove frustrating to the client and therefore damaging to your organization’s image. Instant access to information about available resources and technicians is among the benefits of field service management. The sales process, by its very nature, involves disappointments for the salesperson. Not only that, but records of each successful and unsuccessful contact must be kept, and every customer must be kept engaged right up to (and beyond) the moment they have signed on the dotted line. Field service management solutions can limit the number of unsuccessful interactions, and even allow technicians to carry out certain sales activities while on site with a satisfied and grateful customer. Technicians can, for example, use their mobile devices to deliver documents and collect signatures, prepare invoices, and even carry out cross-sell and up-sell activities. All of this lends valuable support to the regular sales team, especially as the technician on site may be able to make concrete recommendations for the client, based on their observations and the task they are required to carry out. Optimization in field services is founded on synergy between every department and employee in an organization. Field service management solutions drive a company towards achieving its business goals, by drawing the customer sharply into focus and automating many processes. Field service management benefits quickly become clear in terms of service convergence, cost savings, optimized work and dispatch scheduling, and outsourcing.